This cemetery is now the final resting place for nearly 10,000 American soldiers, airmen and navy personnel killed during World War 2. The Omaha Beach American Cemetery is located on the site of the former American cemetery at St. Laurent. This temporary cemetery was established on June 8th 1944 by the U.S First Army following the horrific losses during the allied invasion on June 6th. On the day of the invasion, in the American sector at Omaha Beach alone, there were approximately 3000 American’s killed, wounded or missing. Unlike the other American D-Day landing beach, Utah Beach, Omaha Beach was well defended by very determined German troops. As depicted in the film Saving Private Ryan, the first waves of soldiers landing on the beach were massacred by the heavily fortified German positions. The second wave of American soldiers faired better than the first, mainly due to the increased numbers of men. Due to the greater number of soldiers landing in the second wave, the German’s fire was not as effective. Landing with soldiers in the second wave was heavy material: jeeps, half tracks and trucks. 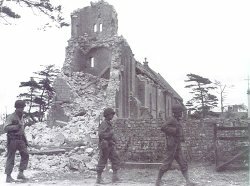 These pieces of heavy equipment met the same fate of the soldiers in the first wave and proved easy targets for the German’s. 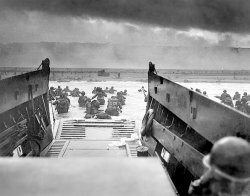 The landings looked as if they were going to fail; however, thanks to the leadership and bravery of small groups of men, the assault gained the first footholds on the beach. Once the foothold was secured, reinforcements landing on the beach pushed forward and secured an area stretching from the beach into the Colleville Sur Mer area. Part of this area would later become the Omaha Beach American Cemetery. 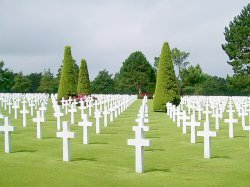 Of the thousands of graves at the Omaha Beach American Cemetery, one of the most notable is that of General Theodore Roosevelt Jr. : Plot D, Row 28, Grave 45.